Commencement is about our graduates, the students you have instructed, advised, mentored, and so often just given a little nudge of encouragement to help them on their education and life paths. Commencement day is ALSO about YOU. And YOU make this celebration a success! Degree candidates will attend by school. 9 a.m. Baccalaureate Ceremony: School of Education, School of the Professions. Reception Following in the Campbell Student Union. 1 p.m. Baccalaureate Ceremony: School of Arts and Humanities, School of Natural and Social Sciences, Individualized Studies. 5 p.m. Graduate School Ceremony: Master's Degrees, Certificates of Advanced Studies. Reception Following in the Second Floor Reception Area of the Sports Arena (adjacent to the Ice Arena). 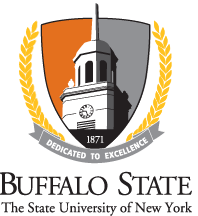 The Commencement Committee extends a warm thank you to the many members of the Buffalo State community who generously offer their time to make our annual May Commencement celebration a memorable occasion for everyone. There are many up-front and behind-the-scenes individuals who make it happen, including the many faculty, staff, emeriti, student, and alumni marchers, hooders, and ushers who dedicate their time to be there for our graduates and their families on Commencement day. See the marchers page or the volunteer ushers page for details. Regisration opens in February. If you have questions, marchers, please contact Academic Affairs. Volunteer ushers, please contact Events Management. Guest tickets are reserved for degree candidates. Faculty and staff who wish to attend the ceremony but do not march or volunteer will have to obtain a guest ticket from a degree candidiate for entry. Faculty, staff, and advisers for departments, programs, and academic and service organizations, etc., please refer to the Commencement Honors Cord & Accessories Policy as you plan recognition for your graduates at Commencement.